On May 29, the U.S. Bureau of Land Management released a regional management plan for the Buffalo Field Office, the Wyoming office charged with managing the Powder River Basin, an area that supplies nearly 40 percent of U.S. coal. Under the proposed plan, the BLM estimates that it will issue 28 new coal leases, which could open up the mining of 10 billion tons of coal over the next 20 years. That seems like a lot of coal. But is it really? “It’s a huge amount, especially because the leasing period is the time frame that the world needs to get a handle on carbon emissions,” Shannon Anderson, an organizer with the environmental non-profit Powder River Basin Council, told ThinkProgress. The United States burns around 900 million tons of coal annually — the amount of coal made available under the proposed Buffalo regional management plan is more than ten times that. According to a report released by Greenpeace, if all 10.2 billion tons of coal made available by the leases was to be burned, 16.9 billion metric tons of carbon dioxide would be released into the atmosphere. That carbon, Greenpeace notes, significantly dwarfs any reductions in greenhouse gas emissions that would come from President Obama’s Clean Power Plan, often considered the president’s most robust action on climate change. The Clean Power Plan isn’t the only environmental action Obama has taken, so it’s not necessarily a one-to-one comparison — but as Joe Smyth, a media officer with Greenpeace told ThinkProgress, it does offer a useful comparison between what is largely considered Obama’s signature piece of climate legislation and the potential climate impact of the BLM’s decision. As Dave Roberts at Vox points out, the regional management plan simply increases the national supply of coal, not the demand for it. The Energy Information Administration estimates that the Clean Power Plan will spur a wave of coal plant retirements, reducing the demand for coal domestically — but that doesn’t mean that the coal mined under the Buffalo regional management plan won’t be shipped to overseas markets. Under the BLM’s coal leasing program, the government also leases land to mining companies under very generous terms — as little as a dollar per ton, according to Smyth. Environmentalists have argued that the government’s generous prices effectively subsidize coal from public lands, selling coal owned by taxpayers at prices that give coal a distinct advantage over renewable energy. According to a 2012 study conducted by the Institute for Energy Economics and Financial Analysis, the federal government has left as much as $28.9 billion in revenue on the table over the last 30 years by offering coal companies below-market prices. The proposed Buffalo regional management plan, Smyth says, suggests that Jewell isn’t taking her own comments to heart. The Obama administration has tentatively approved Shell’s plans to begin oil extraction off the Alaskan coast this summer. Federal scientists estimate the Arctic region contains up to 15 billion barrels of oil, and Shell has long fought to drill in the icy waters of the Chukchi Sea. Environmentalists warn Arctic drilling will pose a risk to local wildlife and exacerbate climate change. They fear that a drilling accident in the icy Arctic Ocean waters could prove far more devastating than the deadly 2010 Gulf of Mexico spill since any rescue operations could be delayed for months by harsh weather conditions. We speak to Subhankar Banerjee. He is a renowned photographer, writer and activist who has spent the past 15 years working for the conservation of the Arctic and raising awareness about indigenous human rights and climate change. He is editor of the anthology, “Arctic Voices: Resistance at the Tipping Point. NERMEEN SHAIKH: The Obama administration has tentatively approved Shell’s plans to begin oil extraction off the Alaskan coast this summer. Federal scientists estimate the Arctic region contains up to 15 billion barrels of oil, and Shell has long fought to drill in the icy waters of the Chukchi Sea. AMY GOODMAN: Environmentalists warn Arctic drilling will pose a risk to local wildlife and exacerbate climate change. They fear a drilling accident in the icy Arctic Ocean waters could prove far more devastating than the deadly 2010 Gulf of Mexico spill, since any rescue operations could be delayed for months by harsh weather conditions. Speaking to KTUU, Lois Epstein of The Wilderness Society denounced the government’s decision to greenlight oil exploration. LOIS EPSTEIN: Their record from 2012 drilling in the Arctic Ocean was a disaster, by anyone’s measure. One of their of drill rigs grounded near Kodiak. There were fires. There were criminal penalties for air pollution violations. AMY GOODMAN: For more, we go to Washington, D.C.—Washington state, where we’re joined by Subhankar Banerjee. He’s a renowned photographer, writer and activist who’s spent the past 15 years working for the conservation of the Arctic and raising awareness about indigenous human rights and climate change, editor of the anthology, Arctic Voices: Resistance at the Tipping Point. His recent piece for TomDispatch is called “To Drill or Not to Drill, That is the Question.” In 2012, he won a Cultural Freedom Award from the Lannan Foundation. Subhankar Banerjee, welcome back to Democracy Now! Can you talk about the Obama administration decision and what this means for the Arctic? SUBHANKAR BANERJEE: The decision is both irresponsible and reckless. But let me clarify something at the beginning. What the administration has approved now is the exploration plans for Shell to drill this summer, starting from July to October. But this is not the—this is the most significant permit that Shell needs, but not all of the permits. 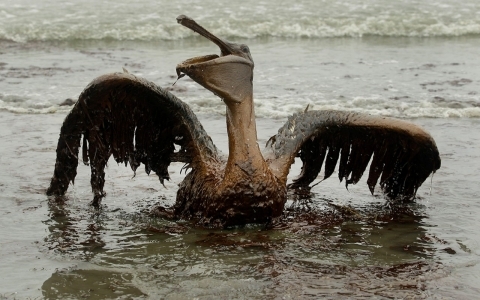 So Shell still needs more permits from, like, NOAA, Fish and Wildlife Service and other federal agencies. So that’s why the activists are working very hard to make sure that some are—some of these permits are not granted, because it’s a reckless decision, as you mentioned, for multiple reasons, the primary ones being a spill in the Arctic Ocean would be far more devastating than what happened in the Gulf of Mexico. And the administration has finally acknowledged, after losing in two federal courts—one in 2010 and one in 2014—that there is a 75 percent chance of one or more major spills if exploration leads to production. So a spill is inevitable. And if a spill does happen, as you mentioned, that, let’s say, a spill happens late in the season, like in October, then that oil will have to be left in place for like nine months, because the sea ice gets covered, covers the Arctic Sea, until the ice melts the following year, when effective cleanup can begin. But even if the spill happens in the summertime, it is a real problem, because the Arctic Sea always has constant dangers of large ice flows—and Shell already encountered that in their 2012 drilling season—as well as deep fog that severely restricts visibility, and the storms have become more violent and more intense. You combine that with the fact that there is absolutely no deep water port in U.S. Arctic—the nearest Coast Guard station is a thousand miles away—and there is no infrastructure in place. Like in your previous segment, you were talking about infrastructure. There is absolutely no infrastructure in place to respond to a large spill. So that’s the spill site. The second site that we need to understand, that Arctic is what is called the integrator of world’s climate systems, both atmospheric and oceanic. Just to give you a couple of examples, what happens in the Arctic affects not just the Arctic, but the whole planet. The severe—recent years, severe winter weather in the Northeast of U.S. as well as the severe ongoing drought in California both have now been linked by recent scientific studies to slowing down of the Arctic jet stream, because the Arctic is warming at a much faster rate than the lower latitudes. And the second one is the Gulf Stream, where you have the warm water from the Gulf of Mexico and the southern latitudes go up to the Arctic, goes down into the deep ocean, gets cold and comes back. It’s called the Gulf Stream, that maintains, again, our oceanic and atmospheric process. That, too, is slowing down. And its impacts are not yet very well understood, but one thing is that it will further contribute to the increase of the sea level. So what happens in the Arctic affects us all, but also to the indigenous people up there. And you mentioned the ecology of the region. If the American public knew what is in those Arctic seas of America—Beaufort and the Chukchi—they will not allow drilling there, because it is truly a national and an international ecological treasure. NERMEEN SHAIKH: Well, according to this ad by Shell, the oil company has developed unprecedented Arctic oil spill response contingency plans. SHELL AD: Shell’s Alaska exploration program is defined by its remoteness, and Shell has gone to great lengths to make sure a worst-case scenario, such as an oil spill, never takes place. But in the unlikely event that one did, Shell’s on-site oil spill response assets would be deployed and recovering oil within one hour. The recovery effort would be aided by nearshore response equipment and onshore oil spill response equipment. This kind of 24/7 response capability is unprecedented. NERMEEN SHAIKH: Subhankar, could you comment on what the Shell ad says and also tell us a little about Shell’s record in the Arctic region? SUBHANKAR BANERJEE: What you just mentioned, Nermeen, is nothing new. It is sugarcoating on an old rhetoric that Shell has been peddling for the last few years. In 2010, Shell spent millions of dollars on an ad campaign called “Let’s Go” to pressure the Obama administration to grant them the various permits, and then towards the—and also another ad called “We have the technology—Let’s go.” So Shell has been saying this for the last at least five years now. Nothing has changed. All of the things I just mentioned previously has not changed. The government acknowledges it, that there would be a major spill. And if it does a spill happen, this whole idea of “We have the technology” is nothing but a PR campaign with no truth behind it, as industry and government would acknowledge, that if a spill does happen in the icy waters, the cleanup would be very ineffective compared to the Gulf of Mexico. And then I forgot the second part of the question—oh, Shell’s record in the Arctic. So Shell went up there with, again, a conditional permit from the Obama administration in 2012, conditional because they were not allowed to drill all the way to the oil-bearing zone, only a top hole drilling to prepare for the following season. And what ended up happening? The very first day they started drilling, they encountered an ice flow the size of Manhattan, 30 miles by 10 miles long, and had to immediately halt operation and disconnect from the sea floor anchor. When they were coming—while they were going up to the Arctic, their drill ship, Noble Discoverer, almost ran aground off of the Dutch Harbor in Southwest Alaska. And then, while coming back, the Noble Discoverer caught fire, and the engine suffered damage, while the other drill ship, Kulluk, was grounded in the Gulf of Alaska, near Sitkalidak Island. And the reason they were bringing the Kulluk back was—actually, to the Seattle waters, Puget Sound water—is because Shell tried to avoid Alaska taxes. So it all goes back to the fact that right now the price of oil is low. And it is truly incredibly irresponsible, when price is—price of oil is low, and the technologies don’t exist, the infrastructure don’t exist, to send Shell up there, because Shell will try to cut costs, as they did in 2012. And the company and its subcontractor, Noble Drilling, was fined a total of $12 million, Noble Drilling, and $2 million to Shell, for violating numerous environment laws, including the Clean Air Act, as well as the Clean Water Act. Angry protesters filled the streets of Karachi last week, clogging traffic lanes and public squares until police and paratroopers were forced to intervene. That’s not rare in Pakistan, which is often a site of political and religious violence. But last week’s protests had nothing to do with freedom of expression, drone wars, or Americans. They were about access to water. When Khawaja Muhammad Asif, the Minister of Defense, Power, and Water (yes, that is one ministry), warned that the country’s chronic water shortages could soon become uncontrollable, he was looking on the bright side. The meagre allotment of water available to each Pakistani is a third of what it was in 1950. As the country’s population rises, that amount is falling fast. Dozens of other countries face similar situations—not someday, or soon, but now. Rapid climate change, population growth, and a growing demand for meat (and, thus, for the water required to grow feed for livestock) have propelled them into a state of emergency. Millions of words have been written, and scores of urgent meetings have been held, since I last wrote about this issue for the magazine, nearly a decade ago; in that time, things have only grown worse. The various physical calamities that confront the world are hard to separate, but growing hunger and the struggle to find clean water for billions of people are clearly connected. Each problem fuels others, particularly in the developing world—where the harshest impact of natural catastrophes has always been felt. Yet the water crisis challenges even the richest among us. California is now in its fourth year of drought, staggering through its worst dry spell in twelve hundred years; farmers have sold their herds, and some have abandoned crops. Cities have begun rationing water. According to the London-based organization Wateraid, water shortages are responsible for more deaths in Nigeria than Boko Haram; there are places in India where hospitals have trouble finding the water required to sterilize surgical tools. Nowhere, however, is the situation more acute than in Brazil, particularly for the twenty million residents of São Paulo. “You have all the elements for a perfect storm, except that we don’t have water,” a former environmental minister told Lizzie O’Leary, in a recent interview for the syndicated radio show “Marketplace.” The country is bracing for riots. “There is a real risk of social convulsion,” José Galizia Tundisi, a hydrologist with the Brazilian Academy of Sciences, warned in a press conference last week. He said that officials have failed to act with appropriate urgency. “Authorities need to act immediately to avoid the worst.” But people rarely act until the crisis is directly affecting them, and at that point it will be too late. It is not that we are actually running out of water, because water never technically disappears. When it leaves one place, it goes somewhere else, and the amount of freshwater on earth has not changed significantly for millions of years. But the number of people on the planet has grown exponentially; in just the past century, the population has tripled, and water use has grown sixfold. More than that, we have polluted much of what remains readily available—and climate change has made it significantly more difficult to plan for floods and droughts. Feeding a planet with nine billion residents will require at least fifty per cent more water in 2050 than we use today. It is hard to see where that water will come from. Half of the planet already lives in urban areas, and that number will increase along with the pressure to supply clean water. Floods will become more common, and so will droughts, according to most assessments of the warming earth. “The twenty-first-century projections make the [previous] mega-droughts seem like quaint walks through the garden of Eden,” Jason Smerdon, a climate scientist at Columbia University’s Lamont-Doherty Earth Observatory, said recently. At the same time, demands for economic growth in India and other developing nations will necessarily increase pollution of rivers and lakes. That will force people to dig deeper than ever before into the earth for water. There are ways to replace oil, gas, and coal, though we won’t do that unless economic necessity demands it. But there isn’t a tidy and synthetic invention to replace water. Conservation would help immensely, as would a more rational use of agricultural land—irrigation today consumes seventy per cent of all freshwater. The result of continued inaction is clear. 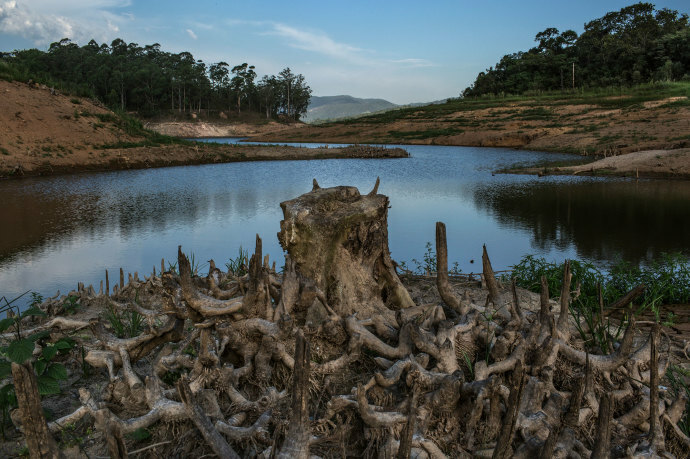 Development experts, who rarely agree on much, all agree that water wars are on the horizon. That would be nothing new for humanity. After all, the word “rivals” has its roots in battles over water—coming from the Latin, rivalis, for “one taking from the same stream as another.” It would be nice to think that, with our complete knowledge of the physical world, we have moved beyond the limitations our ancestors faced two thousand years ago. But the truth is otherwise; rivals we remain, and the evidence suggests that, until we start dying of thirst, we will stay that way. The end of civilization as we know it just got a little closer. According to an update to the Doomsday Clock, the world is now three minutes from midnight and one of the big reasons is the failure to reduce greenhouse emissions even in the face of climate change. The Bulletin of the Atomic Scientists maintains the clock and resets the hands every few years based on existential threats to civilization. Created in 1947, the clock initially served as a warning about the threat of nuclear weapons, but climate change has started to mess with the hands of time in recent years. This is the fourth update to the clock that explicitly mentions climate change, though it’s an issue that has been on the Bulletin’s radar since 1961. The clock was last updated in 2012, when the hands were set at five minutes to midnight. The reason the world is closer to doomsday now is the growing clarity about impacts of climate change, including some already occurring, and the failure to address it. “The reason we feel greater sense of urgency on the climate issue is quantitatively, if you want to limit climate change to a certain magnitude, you’re only allowed to have a certain amount of carbon dioxide in the atmosphere. We’re about halfway there,” Richard Somerville, a oceanographer at Scripps Institution of Oceanography and a board member of the Bulletin, which maintains the clock, said. If emissions continue on their current trend, they’ll likely expend the carbon budget — a term used by scientists to describe how much carbon dioxide can be emitted while safely keeping the world from warming more than the 2°C (3.6°F) — in three decades. Sivan Kartha, another Bulletin board member and senior scientist at Stockholm Environment Institute, said that international climate treaties have weakened in the 20 years of major negotiations with most emissions cuts going from binding to voluntary and emissions cuts failing to come close to staying within the carbon budget. The only time the Doomsday Clock has been closer to midnight was in 1953, a year after hydrogen bombs were tested by the U.S. and Soviet Union in an escalating nuclear arms race. The clock also struck 11:57 p.m. in the Cold War chill of 1984. On the positive side, the clock was moved all the way back to 11:43 p.m. in the wake of the Cold War and the start of nuclear disarmament. What’s keeping the clock from striking midnight now is that despite little to no action on climate change, solutions do exist. Namely, that means transitioning away from fossil fuels toward renewable energy. Some countries have started that transition but Kartha said more efforts are needed and that the coming climate negotiations in Paris later this year could be a crucial turning point. In the meantime, the clock’s ticking. Mega Drought: The New Normal For The American Southwest? According to the Assessment of Southwest Climate Change (Arizona Institute of the Environment), the five decades from 1950 to 2000 were the warmest in over 600 years. The report predicts that reduced snowfall and increased evaporation from global warming will lead to more droughts over the next 90 years. Droughts are a natural part of the climate cycle. As a matter of fact, studies of tree rings going back 1,000 years show mega droughts lasting for decades. Then, nature alone was the culprit, but what happens now when global warming/climate change is superimposed onto nature’s handiwork? Is an intensified mega drought in the works for the United States? California is already burning up. Markedly, to a great degree, America depends upon California for its food. Furthermore, as an aside, how will someone in LA or San Francisco react when, hopping into an A.M. shower, the water barely dribbles out of the faucet? That would be a new twist for California’s famous “ride-sharing” on its slow-moving heated freeways traveling to and from work. As for now, personal bathing in showers in California continues without disruption for the foreseeable future because of advance planning for water shortages by state and federal agencies; however, in many respects the future is now as water resources are running short, quickly, very quickly, and as it happens, America’s dependency upon California for food is only as good as results from drilling into deep water aquifers on farmland, costing $500,000-to-$1,000,000 per job. As it goes, retail food costs are almost guaranteed to go up — a lot. Nevertheless, a much bigger issue is whether California produces food in 2015-20. Recent studies reveal that persistent dry periods lasting for multiple years to several decades have occurred many times during the last 500-1,000 years over North America… These historic droughts are linked to tropical SST variations, with La Nina-like SST anomalies in the tropical Pacific often leading to widespread drought in North America…. Since the middle 20th century, global aridity and drought areas have increased substantially, mainly due to widespread drying since the 1970s… Although natural variations … have played a large role in the recent drying, the rapid warming since the late 1970s has increased atmospheric demand for moisture and likely altered atmospheric circulation patterns … contributing to the recent drying over land. Since a large part of the recent warming is attributed to human-induced GHG increases, it can be concluded that human activities have contributed significantly to the recent drying trend. In short, human influence is once again slowly inching the noose up around its own neck by carelessly burning fossil fuels like there is no tomorrow. At current rates of carbon dioxide emissions, setting new records year-by-year, there may not be much of a tomorrow left for upcoming decades. 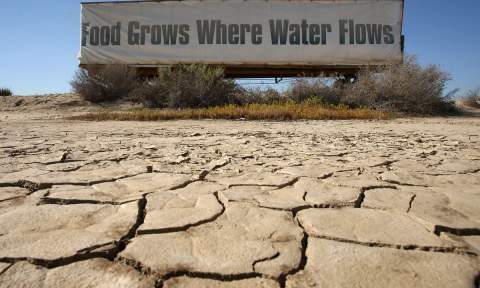 According to the State Water Resources Control Board, California is bone dry. Nearly 50 communities in the state of California are in danger of running out of water. Additionally, the draining of aquifers on California farmland is happening so fast that the ground is sinking, up to a foot in some parts of the San Joaquin Valley, which is a very, very significant part of America’s breadbasket. Sinking ground, in turn, damages irrigation pipes that deliver the water. It’s a vicious circle. A new social media phenomenon “Drought Shaming” has begun in California. This involves people who take videos of neighbors wasting water, and it is posted on Facebook or Twitter. Meanwhile, in Las Vegas the situation is dire, according to climate scientist Tim Barnett, a geophysicist at Scripps Institution of Oceanography: The city must find new sources of water or go out of business. Vegas’s long-standing standby massive water reservoir of the past 80 years, Lake Mead, is depleting so fast that fishermen notice a difference in the water level every few weeks. The Southern Nevada Water Authority is spending $817 million on a new intake that will reach deeper into Lake Mead at an elevation of 860 feet. The two current intakes reside at 1,050 feet and 1,000 feet whereas Lake Mead’s water level is currently 1,082 feet. The ongoing drought in America’s Southwest highlights the importance of the Colorado River, providing water to over 40 million people in the West, including key agricultural production in California’s Coachella and Imperial Valleys, which are extremely important to the food supply for the entire U.S. According to the U.S. Department of the Bureau of Reclamation, the Colorado River, aka: the “lifeblood of the Southwest,” has experienced drought conditions since the year 2000. “It’s time for us to wake up. If this drought continues, we’re going to be in a terrible situation within the next 12-24 months,” says Jay Famiglietti, senior water scientist at NASA Jet Propulsion Laboratory.5 His research, which uses satellites to track changes in water supplies, has confirmed that the Colorado River Basin has lost vast amounts of groundwater during the past decade. Further east, according to the Texas Commission on Environmental Quality, there are 12 water districts in Texas with only 45 days of water remaining. Wichita Falls, Texas, a city of 105,000 is building a water treatment plant that will process local sewage into drinking water. As such, residents will be drinking what they passed into the toilet only days before, which is the epitome of recycling! As the 21st century progresses, human-influenced climate change is forever at the forefront of disaster scenarios, from melting glaciers’ rising sea levels to deformed ocean plankton threatening the base of the food chain as a result of too much CO2, now drought conditions, enhanced by human-caused global warming, threaten food production and adequate water resources. Hansen was wrong. He was too conservative, especially in consideration of the fact that annual CO2 emissions are 50% higher than when Hansen wrote his paper. Bottom line: If fossil fuel (oil, gas, and coal) usage flagrantly continues to spew carbon dioxide (CO2) into the atmosphere, eventually an ice-free Arctic will kick up methane (CH4) like there’s no tomorrow, essentially injecting steroids into the global warming equation, and California will morph into a barren desert wilderness, similar to its ancient past. Then, as large proportions of humanity are forced into a hunter/gatherer lifestyle, roaming eastward in search of sustenance, they’ll crash the gates. It happened in France in the late 18th century when the world’s most powerful nation-state came tumbling down as starving people crashed the gates! There is no escaping the past. Why should it be any different this time around? As such, the real issue is: When will the United States government seriously promote a renewables energy plan? The greenhouse effect is simple science; greenhouse gases trap heat, and humans are emitting ever more greenhouse gases. — Nicholas Stern, British economist and academic, Professor of Economics and Government, Chair- Grantham Research Institute on Climate Change/Environment, London School of Economics. Robert Hunziker (MA, economic history, DePaul University) is a freelance writer and environmental journalist whose articles have been translated into foreign languages and appeared in over 50 journals, magazines, and sites worldwide, like Z magazine, European Project on Ocean Acidification, Ecosocialism Canada, Climate Himalaya, Counterpunch, Dissident Voice, Comite Valmy, and UK Progressive. He has been interviewed about climate change on Pacifica Radio, KPFK, FM90.7, Indymedia On Air and World View Show/UK. He can be contacted at: rlhunziker@gmail.com. Read other articles by Robert. Oldspeak: “Exxon is the first major oil and gas producer to publish a Carbon Asset Risk report to address investor concerns over how market forces and environmental regulations might impact the production of some of its reserves. The company agreed to publish the report several weeks ago. Climate change is already impacting all continents. But it isn’t yet impacting all companies. The latest installment of the Intergovernmental Panel on Climate Change’s Fifth Assessment Report released on Monday confirmed the former. A report released by Exxon Mobil the same day about how greenhouse gas emissions and climate change factor into its business model found that climate change, and specifically global climate policies, are “highly unlikely” to stop it from selling fossil fuels for decades to come. Exxon is the first major oil and gas producer to publish a Carbon Asset Risk report to address investor concerns over how market forces and environmental regulations might impact the production of some of its reserves. The company agreed to publish the report several weeks ago after Arjuna Capital, a sustainable wealth management platform, and As You Sow, a non-profit promoting environmental corporate responsibility, agreed to drop a shareholder resolution on the issue. These shareholders have concerns that Exxon Mobil’s assets will become worth less as fossil fuel restrictions come into place in coming years and climate change becomes an even more immediate and dire societal problem. In the report, Exxon didn’t feel the need to sound any alarm bells. Balancing these economic aspirations means that carbon dioxide emissions from energy sources peak around 2030 and begin to decrease within a decade after that as demand for access to electricity and heat is offset by increased efficiency and advances in low-carbon and renewable technologies. The world will require 35 percent more energy in 2040 than in 2010, according to the report, and Exxon Mobil does not believe that new forms of energy will be able to supplant traditional hydrocarbons in that period. “This reality” being the one depicted in the new IPCC report that warns of the breakdown of food systems, new and prolonged poverty traps, and increased risks of violent conflicts and civil war. These warnings go far beyond investor’s concerns, and would require a commitment from Exxon Mobil to address — not just a statement of acknowledgement. LONDON, 7 February – The good news, from the climate’s standpoint, is that while global demand for energy is continuing to grow, the growth is slowing. The bad news is that one energy giant predicts global carbon dioxide emissions will probably rise by almost a third in the next 20 years. The Intergovernmental Panel on Climate Change says greenhouse gas emissions need to peak by 2020 and then decline if the world is to hope to avoid global average temperatures rising by more than 2°C over pre-industrial levels. Beyond 2°C, it says, climate change could become dangerously unmanageable. But BP’s Energy Outlook 2035 says CO2 emissions are likely to increase by 29% in the next two decades because of growing energy demand from the developing world. It says “energy use in the advanced economies of North America, Europe and Asia as a group is expected to grow only very slowly – and begin to decline in the later years of the forecast period”. But by 2035 energy use in the non-OECD economies is expected to be 69% higher than in 2012. In comparison use in the OECD will have grown by only 5%, and actually to have fallen after 2030, even with continued economic growth. The Outlook predicts that global energy consumption will rise by 41% from 2012 to 2035, compared with 30% over the last ten. An advantage claimed by some supporters of shale gas is that it will increasingly replace a much more polluting fossil fuel, coal. But at the moment many coal-producing countries are finding markets overseas for those they have lost to shale gas at home. Oil, natural gas and coal are each expected to make up around 27% of the total mix by 2035, with the remaining share coming from nuclear, hydroelectricity and renewables. Among fossil fuels gas, conventional as well as shale, is growing fastest and is increasingly being used as a cleaner alternative to coal. Bob Dudley, BP Group chief executive, said the Group was “optimistic for the world’s energy future”. Europe, China and India would become more dependent on imports, he said, while the US was on course to become self-sufficient in energy.